Completement your cover or logo with our bright Royal Blue plastic binding combs. 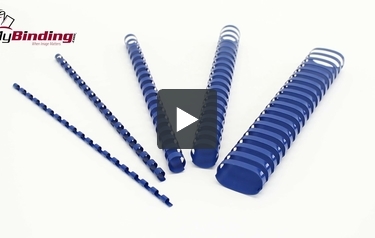 These royal blue plastic combs are some of the highest quality binding combs on the market and are designed to fit any standard plastic comb binding machine . Hand-rolled to provide a smooth glossy finish, these royal blue combs allow pages to flip freely and lie flat for easy reading and margin to margin photocopying. After receiving our electronic binder and start-up kit I realized that we needed larger sized binding combs for various projects . I was happy to see that there were other colors that could match our color themes as well. Extremely happy with both when product arrived nad the color was a perfect match for our organizational theme. Also a simple product that does what it's designed to do. Still no complaints. Perfect and exactly what was needed for the job. Welcome to MyBinding video. Here at MyBinding, we have an array of plastic binding combs, including blue. Ranging from 3/16" to 2", there's a comb for any size project. Here at MyBinding, it's also important for us to ask 'why blue?' Maybe you want to match your favorite stairwell door or compliment your favorite red wall but blue also goes great with the sky. With the many comb choices, you can fit from 1 sheet to 425 sheets, so no matter why you choose blue, it will get the job done right. Proper use allows for pages to flip easy and lay flat, making reading a breeze and allows for getting the right margins for photocopy. This 19-hole pattern is compatible to fit any standard comb binding machine, so no matter what machine you use, these combs should do just fine. These combs are made to last the test of time. They won't scratch, chip, peel or discolor. Perfect for the day-to-day project, these smooth, glossy, blue binding combs may be just what your project needs. For more demos, reviews and how-to's, go to MyBinding.com. How can I get these Royal Blue combs custom printed with our company name? Any of our plastic combs can be printed on to add the title of your report, your company name or even your logo. Please give our customer service department a call at 1-800-944-4573 and they should be able to provide you with a quote for custom printed combs.